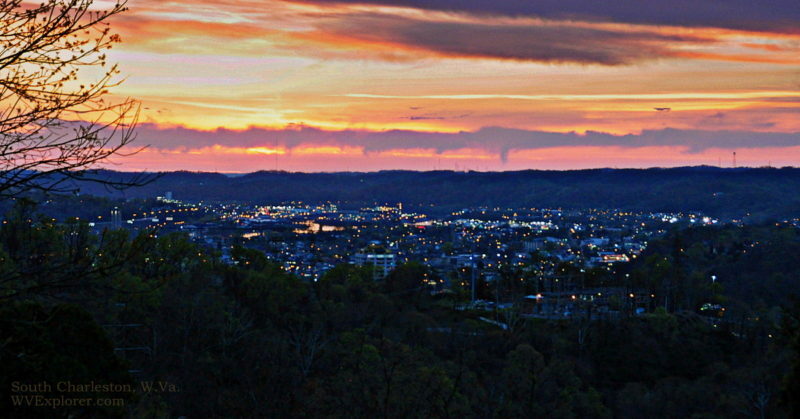 As seen from Capitol Hill in Charleston, West Virginia, the lights of South Charleston twinkle in the westward valley. South Charleston, West Virginia (WV), a city in Kanawha County, was established in 1906, incorporated in 1917, and so-named for its location on the south bank of the Kanawha River downstream of Charleston. Two prehistoric burial mounds punctuate the cityscape — the Criel Mound, at 7th Avenue at D Street, and the lesser-known Cemetery Mound, at Sunset Memorial Cemetery. The townsite was platted in 1907 by M. W. Venable for the Kanawha Land Co. and become one of several West Virginia cities in which chemical plants were built just prior to World War I. In 1925, Union Carbide Corp. moved its petrochemical plant from Clendenin to Blaine Island in South Charleston, and launched production of several ethylene-based chemicals. By the late 1920s several industries had located within the community — chemical plants, glass plants, and a U.S. government armor and projectile plant. South Charleston is now principally a residential community favored its its mild weather and centrality within the Charleston (WV) Metropolitan Area. Its largest employers include Thomas Memorial Hospital, Dow Chemical, City of South Charleston and Bayer Material Science. Its population in 2010 was 13,450. South Charleston is located on the I-64 expressway at highway US-60 approximately two miles west of Charleston, West Virginia, and two miles east of Dunbar, West Virginia, and three miles east of Saint Albans, West Virginia. 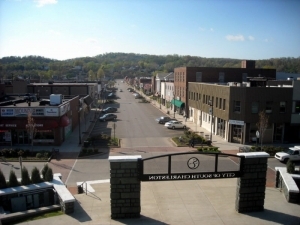 South Charleston is located in the Metro Valley Region in western West Virginia.